Passenger numbers have shot up again at South Tottenham, increasing by more than half year on year. Our petition calls for an upgrade to help cope. The latest figures for 2012-13 show the station handling 657,598 entries or exits. That’s compared to 441,988 the year before and just 45,834 in 2004-05. South Tottenham station is now busier than Wrexham, Rotherham Central or Stratford International. It’s no surprise London Overground has been a great hit. The line has been transformed since Ken Livingstone took the initiative of bringing the old North London Line into TfL. A run down, unreliable and infrequent service has improved in leaps and bounds with more trains and staffed stations. But it has become a victim of its own success, suffering from overcrowding. 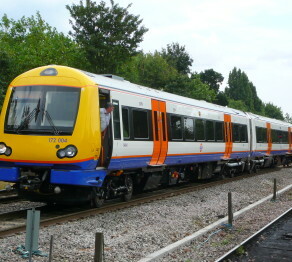 While the rest of London Overground has spacious electric trains, Gospel Oak – Barking is still served by two carriage diesels. TfL are rightly increasing capacity even further on the rest of London Overground, but so far the Gospel Oak – Barking line has lost out. Electrification of the line to increase capacity and reduce pollution has been long discussed. It is supported by TfL and London’s Mayor – as well as industry and passenger groups. Delaying the work beyond the completion of Crossrail in 2018 will increase costs and disruption. This entry was posted in Transport and tagged GOBLIN electrification, London Overground, South Tottenham station, Transport for London on June 3, 2013 by admin.